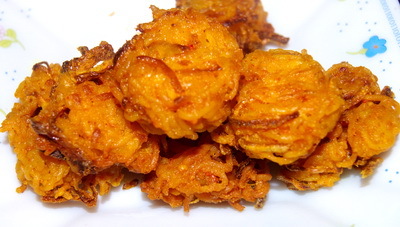 Noodles Pakora / Noodles Fritter is very easy and handy recipe with bit of freshness. 1. Boil the noodles and strain it. 2. Mix well all ingredients with noodles. 3. Heat the oil on medium high. When oil is ready, make fritter of noodles and fry it till it is light golden or crisp in outside. 4. Serve Noodles Pakora / Noodles Fritter hot. Tips: if you want, you can use more flour. I love your recipes so much.Can you please post noodles recipie in Bangladeshi style.Thank you. THANK YOU VERY MUCH FOR POSTING RECIPES,I LOVE ALL THESE.I HAVE TRIED SOME OF N THOSE CAME OUT ACTUAL N AWESOME! REALLY BECOME A GREAT FAN OF YOU. PLS LET ME CONFIRM ONE THING THAT WT IS TALMAKHNA,IS IT METHI OR ELSE? Thanks for your good word. Talmakhana is usually used for making Fuska. It is available in Bd. If you want to make fuska , I have recipe for fuska with out talmakhana too. Thanks for this recipe, its a great way to use up left over noodles. My bro loved them and didnt even guess that the main ingredient was noodles. I had to add some water to make the mixture stick together. hi what kind of flour is used for noodles pakora?